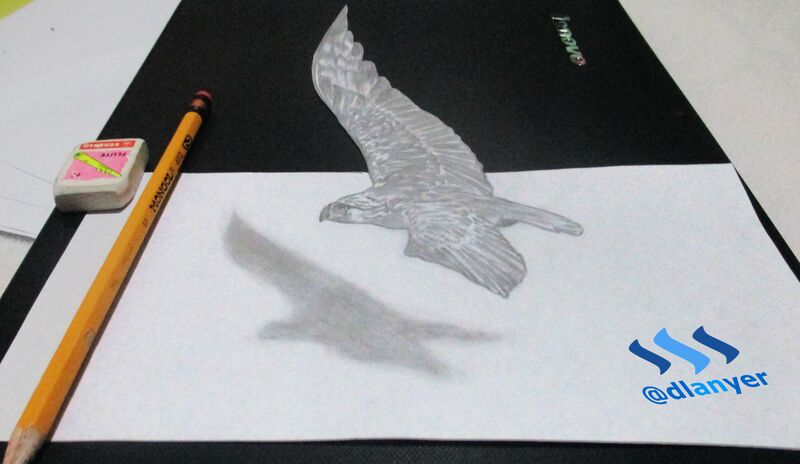 Now I'm back to share with you what I drew by using again a three-dimensional (3-D) optical illusion drawing method and this drawing is a Philippine eagle. The Philippine eagle, also known as the monkey-eating eagle or great Philippine eagle is considered to be one of the three largest and most powerful eagles in the world. Unfortunately, it is also one of the world’s rarest and certainly among its most critically endangered vertebrate species. Let me show you how I did it...! Step 1. I have to draw first a shape that looks like a flying bird if we view from selected angle and this is as a guide for details of the eagle. Step 2. I made details for the eagle's head. Step 6. to look like it’s flying more, I used cutter blade to cut or remove this highlighted part. Have a great day again.....!